For several weeks in Bogor and its surrounding areas, the weather had been overcast and rainy. Nonetheless, this did not distract me from my office drudgery which had fallen into a rhythm of monotonous and unfullfilling work. Enjoying the outdoors is one activity I enjoy which helps reduce my stress. Taman Wisata Alam (TWA) Telaga Warna was my chosen destination on this trip. I gathered and prepared my binoculars and camera. 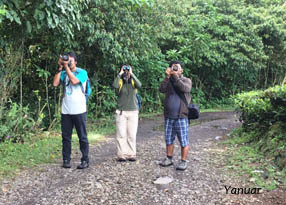 It was a cloudy morning all the way upto Puncak, but it failed to dampen my spirit and enthusiasm for birding. Suddenly there were some signs of sunlight creeping through the clouds that boasted my mood for some birding and bird photography. The one hour drive drive through Puncak, free of traffic on Saturday (1/4/2017) arriving at TWA Telaga Warna further lifted my mood and spirit. The birdsong of a Rusty Breasted Cuckoo (Cuculus sepulcralis) opened up my bird list for the day and the Blue-eared Kingfisher (Alcedo meninting) that was perched on the flying fox cabel was my first photo of the day. I was looking to settle in a lush, green location and the quieter I was the more active the birdsong became. The birds were not disturbed by my very presence. A Trilling Shrike-babbler (Pteruthius aenobarbus) was looking for a feed whilst singing. I continued walking further into the forest. The wet leaves and cool air, a welcome reminder of the tropical rainforest conditions here in West Java. I had not heard any bird song, so I decided to leave the rainforest because I saw an interesting building. “Ahh..this building is an ideal shelter for me and my friends during birding surveys ,” said my inner voice. The closer I got to this building, the more I realised it was a new building. It consisted of two large buildings which pointed towards the direction of the forest edge. 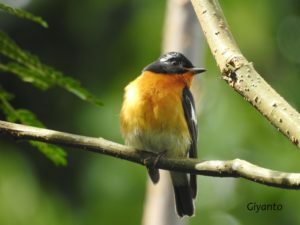 This particular building turned out to be home to birds, rewarding my efforts as I saw a sweeping Mugimaki Flycather (Ficedula mugimaki) which came to perch on a tree near the tea plantation. I continued to look for birds. 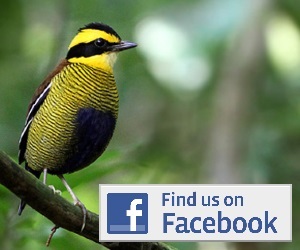 The forest edge is a great spot for birdwatching. I stayed quiet and observed the trees branches and birds would just appear. As I started to get a little bored, I went inside the forest a little. I saw a male and female of Little Pied Flycathers (Ficedula westermanni) moving from one branch to another. Then I heard the sounds of Lesser Shortwing (Brachypteryx leucophyrs) nearby, but despite looking I was unable to see them with my eyes. As the sky turned to a dark gray, clear signs of approaching rain. 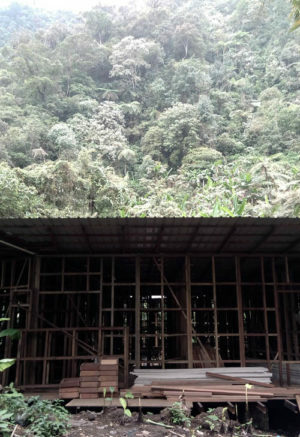 I retreated to the building being built for a shelter. As I waited for the weather to brighten, I saw a Lesser Shortwing rummaging for food under the shelter. “It seems there is a nest here,” said Adhy. Finally we stayed here and watched the Lesser Shortwing go backwards and forwards looking for food, but we did not find the nest. Every now and then a Pygmy Wren-babbler (Pnoepyga pusilla) appeared infront of the shelter, upon noticing us it would run and hide under the building. When the rain had stopped it was time to go home. At the moment we decided to leave, the unique sounds of the Asian Brown Flycather (Muscicapa dauurica) called to us. We paused to enjoy it then continued home. 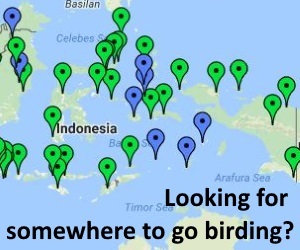 Aahh, not bad at all, we managed to see and hear 23 species of birds at TWA Telaga Warna on this visit.